Well hello! It has been a full month since I last blogged. Life has been absolutely crazy- I made it to the final four in my law schools interscholastic appellate advocacy competition which involved 2.5 weeks of daily practices and constant revision on top of reading, class, work and food/sleep. It cumulated in an oral argument in front of 3 real, federal judges as well as our whole student body. It was stressful and exhausting but such a great experience. 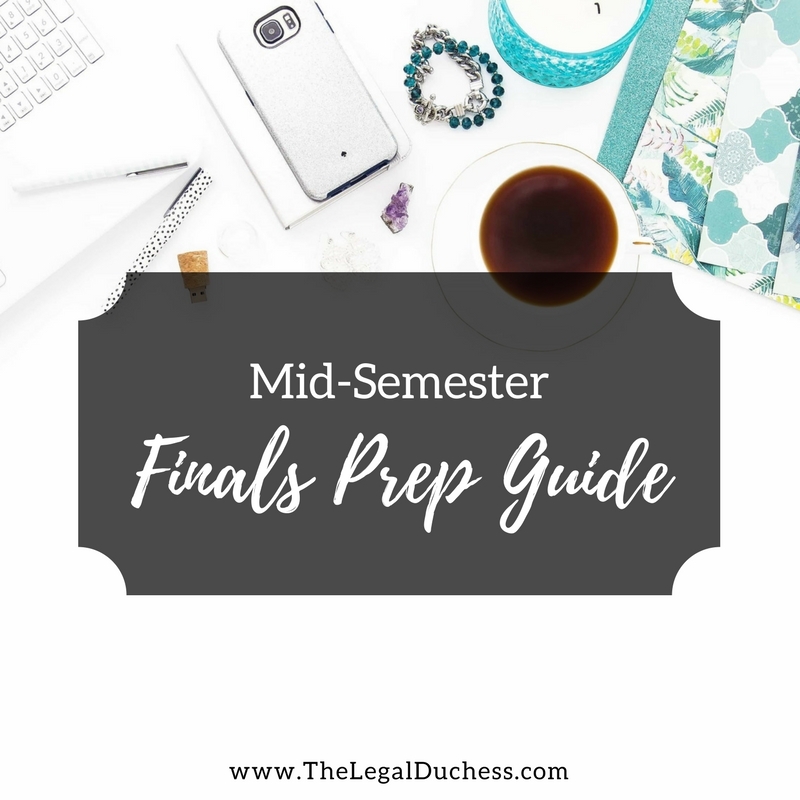 It is now midway through the semester and I know there are many 1L's out there getting stressed about final exams but are not sure quite what to do to start preparing. I have gotten a few questions about prepping for finals so I am sharing what I am doing at this point in the semester to start prepping for final exams. I hope it helps! I know every 1L ever is beyond tired of hearing the word outline but this is the time to be working on them and updating so you don't end up spending your whole Thanksgiving break outlining. I have been working on updating all of my outlines to the current point of material so that I can relax more on Thanksgiving break this year. For more on outlining see this post: A Guide to Outlining. Now is the time to clear up confusion in the material. As you are outlining, make note of areas where you are confused or your notes were messy. Go get it cleared up by the professor sooner rather than later so you are not stressing at the last minute and fighting for office hours with all the people who waited until the week before exams to ask for help. Having your outlines updated will help you to know if there were confusing areas you need to get some help with. Then you know that whatever info is in that final outline is correct and you fully understand it. Law school essay questions are a new breed of essays you have likely never encountered. My biggest downfall my first semester of law school was not doing enough practice questions, not being comfortable with how to write them out and not having a solid plan for how to attack them. I highly highly suggest tracking down some practice essay questions for each subject and taking some time to write them out in exam-style conditions. It will help you to become comfortable with the feel of law school essays and make it less intimidating come exam day. The best case scenario is getting old practice questions from your professor along with model answers. If you can't get those, many of the bar prep companies give out free study materials on first-year subjects and there is also tons available online after a simple google search. There are often practice questions in your casebooks as well so make sure to look there. Just like essays, law school multiple choice questions are very different from other multiple choice. Find some to practice and get comfortable with them. It will make exam day way less stressful when you are prepared for the type of questions you will encounter. In addition, practice essay and multiple choice questions can pinpoint some weak areas in your understanding of the subject that need to be cleared up before exam time. I know it seems crazy early, but it is time to start actually studying. Practice essay questions and practice multiple choice are a part of that but substantively studying the material is most important. I like to start making flashcards and reading over my outlines at this time. I also start meeting with my study group or study partners to go over out outlines and ensure that we have everything/there are no holes. I love group studying but it is not for everyone. If you are studying solo, start making a habit out of studying and find a good spot for it. 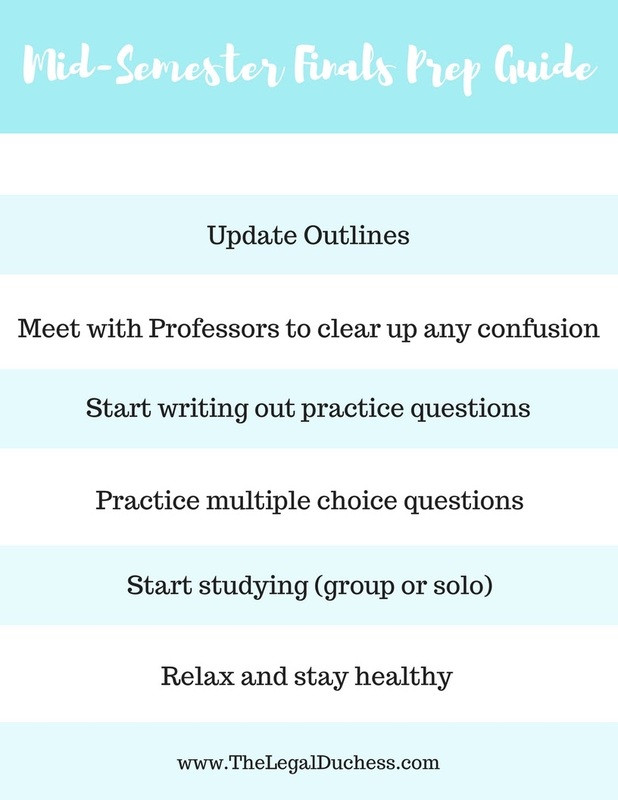 If you plan to group study, start meeting with your group and ironing out the kinks. Law school exams require you to know and understand a massive amount of information. The earlier you start studying, the better. Don't get me wrong, this is a stressful time and working hard is vital. But doing so at the sacrifice of your mental and physical health is not good. Eat well, get plenty of sleep, take some time for yourself and the things you enjoy, exercise and spend time with friends and family. Law school takes over your life but you have to fight back a little bit and keep yourself happy and healthy. Also, it is cold and flu season so it wouldn't hurt to start taking a multi-vitamin and vitamin C- it is no good to be sick during exams!! Here is a free printable to help you stay on track! Best of luck to all! Thankfully, the light at the end of the first-semester tunnel is growing closer.